On a recent flight back from Europe I had a chance to catch an engaging documentary about Malala Yousafzai, the young Pakistani girl who was shot along with two friends by Taliban rebels for their efforts to promote the education and freedom of young women to live the lives that they choose. 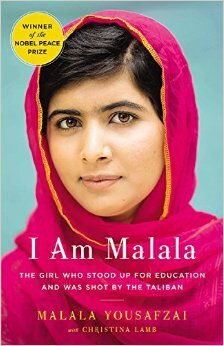 The shooting nearly took her life, killed her but miraculously she survived and went on to become a Nobel Peace Prize winner and spokesperson for thousands of young women throughout the world who are also denied the right to a formal education, freedom of thought and freedom of expression. Upon returning from abroad, I added her autobiography to my list of books to read and after finishing this book, my only regret is that I did not read it sooner. I find it hard to put into words how much admiration I have for this young woman for her courage and efforts to improve her homeland of Swat, Pakistan. Although she no longer lives in the village of Swat, she still retains an emotional and spiritual connection to the place of her birth. In recent years, she had developed into an excellent public speaker and highly articulate young lady whose voice has been heard in by millions. Resettled into a neighborhood in Birmingham, England, her family has adapted to the British way of life but will forever remain Pakistanis as heart. Their plight and eventual relocation is a story of which most of us here in the west could never see ourselves telling. We are fortunate to live under the rule of democracy, a constitution and a bill of rights that guarantees each of us rights that are dreamed of by people from nations on all continents. And through this wonderful and yet tragic account, I learned not only her story but many facts about the history of Pakistan and its tormented relationship with India that has never healed. From its beginning, Pakistani society been volatile with murders, assassinations and political coups overthrowing one government after the next. And with the fallout from the 9/11 attacks and the U.S. government’s pursuit of the Taliban, the nation of Pakistan has been transformed into one of the most dangerous places on earth. Through voices such as Malala, our eyes and ears can be opened to the life that lies ahead for many of the young in the Middle East. Posted on March 8, 2016, in Biographies and tagged Malala, Pakistan. Bookmark the permalink. Leave a comment.